This classic red barn in Williamston is owned by Dean Hunter, who takes a keen interest in antiques – especially of the mechanical variety. His farm boasts an assortment of old tractors and automobiles, some of which date back to the early 1900s. Hunter has a special penchant for steam engines and is said to own the largest collection of stationary steam engines in our state. Many of his steam engines came from a collector in Missouri, and several of the larger ones once powered textile mills. Hunter Farm is also home to two fully-operational steam-powered trains, one of which runs on a 7.5-inch track and the other of which runs on a two-foot track. Up to 30 people can ride on the latter train. Both tracks run over a mile, forming a loop around the farm’s pond and dam. The Hunter family enjoys opening its doors to those who share similar interests. 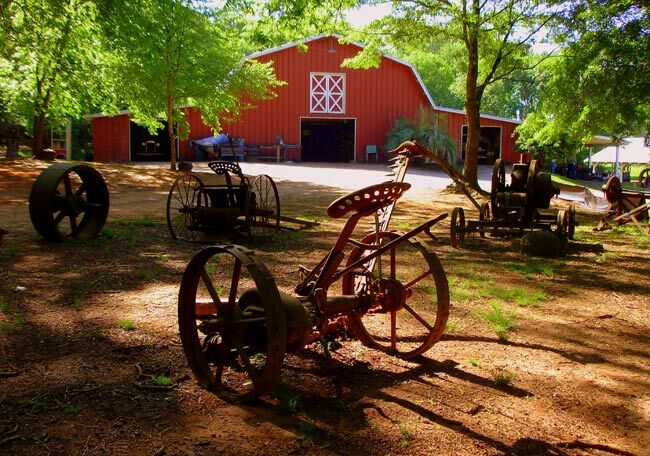 Each spring, the family hosts its annual Old Farm Days celebration here, a private event for those interested in antique engines and farm implements. The farm has also served as a stop along the annual SC Young Farmer and Agribusiness Association Educational Tour, and A-model and classic car clubs meet here throughout the year. Hunter even operates a double-decker bus to take people on tours of his property! To learn more about visiting, please call Norman at 864-643-9196. Hello Barbara, you would have to reach out to the owner directly. His name is Norman and his phone number is towards the bottom of the post. Hope this helps! Can we come up from Honea Path and make pictures? Thank you and have a blessed day. Would like to speak to you in regards to a steam-powered pick up truck I have. We live outside of Clover, SC and may be able to come down sometime. Having shoulder surgery and won’t be able to do a lot but would love to chat. You need permission from the owners, as it is private property. Can I come and take pictures on the property? Thank you, Norman! This info was incredibly helpful, and we have added it to our page above. The address is 4300 Hopewell Rd. Williamston, SC There is an annual event that takes place there. This year it will be May 2, 2015 It is called Old Farm Days at the Hunter Farm. Does anyone have any contact information and/or address for this location? I’d very very much appreciate it. Thanks! Can anyone go here and take photos?